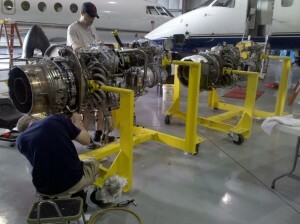 We were contacted by an aircraft service facility which required several frames for supporting aircraft engines during change outs and other types of maintenance. No standards were available. Our task was to measure an engine, determine the best method of support (from examining how it was mounted in the airplane), then design a wheeled stand which allowed for access to all areas of the engine. The stands had to disassemble for storage when not in use. While this project was quite straightforward, it had to be done carefully in order to eliminate any risk in handling the over $1,000,000 engines! 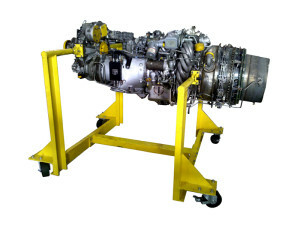 Product Description – Stand for Aircraft Engine.